Napa: Before we dive into the latest chapter in the ongoing trainwreck that is Copia, let's quickly recap the situation. Millions and millions of dollars in debt, they hiredTyler Florence to "run" the restaurant in September. Then they announced a San Franciscoexpansion. Then, the bank was like, wtf? Then, there were lots of layoffs. ...the large and underutilized wine, food and art center in downtown Napa is almost surely going to be downsized. Copia CEO Garry McGuire says the nonprofit organization will sell its building and campus by the end of the year, and then either lease back part (the first floor) or move to smaller spaces. The organization has a debt of $78 million, and prospective buyers are already dealing with a 50 percent write-down in value according to a knowledgeable source close to the organization. The headquarters for the "financially challenged" (how's that for a euphemism?) 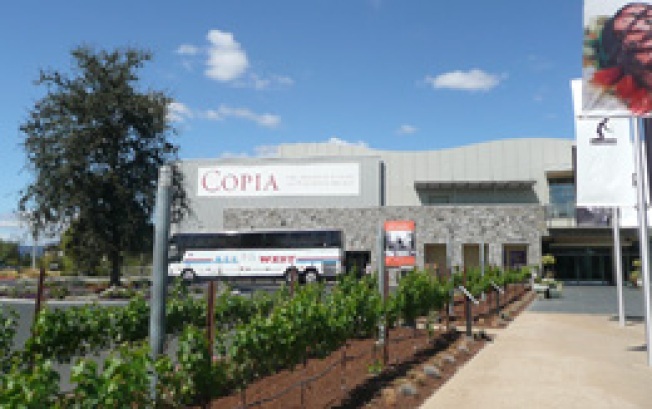 Copia, Julia's Kitchen and gift shop will reportedly stay in Napa, though it's unclear as to where exactly in Napa. As for that reputed San Francisco Copia branch, McGuire says that the two main contenders are the Ferry Building and the Metreon; given the latter's new focus and looming remodel, we'd put the early money on the Metreon. Besides, there's something oddly poetic about two of the highest-profile commercial flops of the last decade coming together, no?